There seem to be links between fibromyalgia syndrome and joint hypermobility syndrome – both can include symptoms of widespread pain, and hypermobility syndrome seems to be more common in people with fibromyalgia syndrome than in the general population. People with hypermobile joints are able to move their joints, or bend or stretch their bodies, much further than the rest of the population. Joint hypermobility is often inherited, and about 5-15% of the population has hypermobile joints (this can increase to as much as 38% in Middle Eastern women). In some people, hypermobile joints have no symptoms other than increasing their bodies' flexibility, and it can be used to an advantage, for example in dance or sport, or in playing an instrument. However, in people with joint hypermobility syndrome, the hypermobility of the joints can lead to pain and other symptoms after excessive or repetitive movement. As well as having hypermobile joints, people with joint hypermobility syndrome may also have skin that is thinner and more fragile than other people's skin, and they may bruise more easily. Young people with joint hypermobility syndrome may develop stretch marks on their skin during periods of fast growth. Another symptom is known as ‘proprioceptive impairment’, where patients don’t ‘know’ where they are physically in space, which can make them less stable and prone to falls, and awkward or clumsy. Some people with joint hypermobility syndrome (possibly up to half) are more sensitive to pain than the rest of the population, and have pain at a number of sites across their bodies. Other symptoms can include low blood pressure when standing up, light-headedness and fainting, tachycardia (fast heart rate), anxiety, panic attacks, tiredness and heat intolerance. Some scientific studies have suggested links between joint hypermobility syndrome and fibromyalgia syndrome. A Canadian study showed that almost half of their patients with joint hypermobility syndrome also had widespread pain at multiple sites. A study in Spain also linked fibromyalgia syndrome and joint hypermobility syndrome - in the study, 27% of the women with fibromyalgia syndrome had hypermobile joints, in comparison with 11.4% of women with other rheumatological disorders. In a study in Israel in children, 81% of the children with fibromyalgia syndrome also had joint hypermobility syndrome, and 40% of the children with joint hypermobility syndrome also had fibromyalgia syndrome. Not all studies show a connection between fibromyalgia syndrome and joint hypermobility syndrome, suggesting that joint hypermobility syndrome could just be misdiagnosed as fibromyalgia syndrome – this shows that more research is needed. 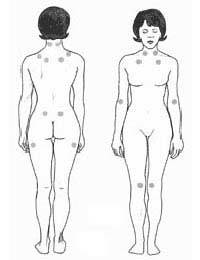 Does Joint Hypermobility Syndrome Cause Fibromyalgia Syndrome? I am.horrified to find this link. I've just been told am hypermobile, just thought l was flexible Now the widespread pain anxiety and skin thinness is explained. How do people manage this? It's scary. I've been diagnosed with Hypermobility but I'm beginning to think it could be Fibromylgia as i expiernce a lot of pain all over my body & sore to touch!! !